Thorstein Bunde Veblen (July 30, 1857 – August 3, 1929) was an American sociologist and economist who applied the evolutionary approach to the study of economic institutions. His first book The Theory of the Leisure Class (1899), embodying his main ideas, became a classic that continues to be popular. Despite this success, Veblen did not achieve academic respect. His critical, often contemptuous, approach to university life, his marital problems, together with his lack of popularity as a teacher drove him out of academia. Veblen's pessimism prevented him from participating in social or political action, even though he had creative and valuable insights into social and economic problems. Thorstein Bunde Veblen was born Tosten Bunde Veblen on July 30, 1857 in Cato, Wisconsin, into a family of Norwegian immigrants. His nephew, Oswald Veblen became a famous mathematician. The Veblens spoke only Norwegian at home and Thorstein did not learn English until he was a teenager. The family moved to Wheeling, Minnesota in 1865, and he received his elementary education there. He obtained his B.A. at Carleton College, Minnesota in 1880. He studied under one of the leading neoclassical economists of the time, John Bates Clark, but rejected his ideas. Later he did his graduate work at Johns Hopkins University, under Charles Sanders Peirce, the founder of the pragmatist school in philosophy. He graduated in 1882, and transferred to the doctoral program at Yale University. He received his Ph.D. in 1884, having studied under the famous proponent of laissez-faire, William Graham Sumner. Veblen rejected his views as well. At Yale, Veblen took Moral Philosophy as his major and wrote his doctoral thesis on Immanuel Kant, under the title The Ethical Grounds of a Doctrine of Retribution. For the next six years, from 1884 to 1890, Veblen was unemployed, living on his parents’ farm. Unable to find work as a teacher, he spent his time in reading, writing, and translating. In April 1888, he married Ellen May Rolfe, and moved to live with her parents. He worked briefly as a tutor at Cedar Valley Seminary in Iowa. In 1892, Veblen decided to resume graduate school studies, now in economics, at Cornell University in Ithaca, New York. With help from James Laurence Laughlin, professor of economics, he received a scholarship. When Laughlin became head of the department of economics in the newly founded University of Chicago, he invited Veblen to teach there. At first, Veblen served as a reader in political economy, later being promoted to assistant professor. At the same time Veblen worked as managing editor of the Journal of Political Economy (1896-1905). In 1899, he published his first and most famous book, The Theory of the Leisure Class, which established him as a renowned scholar. In 1906, Veblen had to resign his position at the Chicago due to scandal. He already had a reputation as a womanizer, whose numerous affairs created problems not only in his private life, but his work as well. The administration of the university finally in 1906 decided to force him out, accusing him for “flagrant marital infidelities.” His wife divorced him a few years later. In 1906, Veblen moved to California and received an appointment at Stanford University, as associate professor of economics. However, due to new affairs and scandals, which again involved his personal life, coupled with unpopularity as a teacher, he resigned the post in 1910. In 1911, he received a position at the University of Missouri-Columbia, due at least in part to support from Horace Davenport, the head of the economics department. Veblen was not fond of Columbia, Missouri, never fully adapting to the atmosphere of a “small” university. He stayed there until 1918, and 1914 he married his second wife, Ann Bradley, whom he known since 1904. In 1919, Veblen, along with Charles Beard, James Harvey Robinson, and John Dewey, helped found the New School for Social Research (later known as The New School). Veblen and his family moved to New York City, and Veblen became a lecturer at the New School. He published several works in this period, among others Higher Learning in America (1918), The Vested Interests and the Common Man (1919), and The Engineers and the Price System (1921). His second wife Ann had a nervous breakdown and died in 1920. Veblen retired in 1926 from the New School, and moved back to California. He died in 1929 from heart disease. According to Veblen's analysis, the key in human evolution is the invention of new, more effective technologies. Society progresses through learning how to deal with the material means of life. The goal of economy thus is simply to more effectively adapt man to his natural environment, and technology and industry play key roles in that process. Social and economical institutions play important role here, as they carry the evolutional progress. Natural selection, said Veblen, is happening between institutions, as they adapt to the new circumstances in the environment. The old institutions have to die in order for new ones to take over. 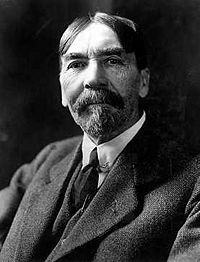 Veblen became well known after the publication of his book The Theory of the Leisure Class (1899). The book is seemingly a satirical look at American society, an attack on the ways of the aristocratic class. But implicitly it explores the deep questions of human nature, particularly the nature of economic man. The book came out in the time when Marxist thought had become increasingly popular, and the majority of economists incorporated Marx’s ideas into their works. Veblen’s theory of the leisure class was different from Marx’s. Unlike Marx, who argued for the “historical struggle” of classes, where lower classes fight to overthrow the upper classes, Veblen believed that lower classes strive to climb up to a higher class. This is, claimed Veblen, an important motivational force in economy. Veblen acknowledged, however, that in capitalist society there is a class struggle, but that it is not between classes, but between two processes—making money and making goods. In other words, the struggle is between businessmen (bankers, lawyers, brokers, managers) and industry (engineers, designers, technicians, and labor), between those who are solely interested to maintain the present condition in the society, and those whose goal is innovation and progress. Here Veblen identified the main conflict in society—stagnation vs. innovation. Social change takes place when the new technologies are developed and when the society adapts to them. Thorstein Veblen's career has to be understood in the context of his times. He worked amidst the growth of the disciplines of anthropology, sociology, and psychology. He argued that culture inevitably shaped economics and that no universal "human nature" could possibly explain the variety of norms and behaviors discovered by the new science of anthropology. Veblen was ultimately interested in the social and cultural causes and effects of economic change. Questions like: “What is the social or cultural cause of the shift from hunting to farming?” are central in his theory. An important analytical contribution became associated with Veblen, later known as the "ceremonial/instrumental dichotomy." Veblen saw that although every society depends on tools and skills to support the "life process," every society also appeared to have a stratified structure of status ("invidious distinctions") that ran contrary to the imperatives of the "instrumental" (technological) aspects of group life. This gave rise to the dichotomy of the "ceremonial"—related to the past, supporting the tribal legends, and the "instrumental"—oriented toward the technological imperative to judge value by the ability to control future consequences. "Conspicuous consumption" is the term Veblen used to describe the lavish spending on goods and services that are acquired mainly for the purpose of displaying income or wealth rather than to satisfy a real need of the consumer. In the mind of a conspicuous consumer, such display serves as a means of attaining or maintaining social status. Veblen used this term to depict the behavioral characteristic of the nouveau riche, a new class that emerged in the nineteenth century capitalistic society as a result of the accumulation of wealth during the Second Industrial Revolution. In this context, the application of the term should be narrowed only to the elements of the upper class, who use their enormous wealth to manifest their social power, whether real or perceived. In its original meaning, the term can be easily applied to the nouveau riche that rise due to rapid development of the emerging economies such as Brazil, China, India and Russia. The term can also be applied to ancient times, such as the creation of the Egyptian Pyramids. To some extent, it can be used to describe the spending patterns of corporate managers who support their lavish lifestyles at the expense of the shareholders of the companies they manage. Veblen also introduced the term, "Conspicuous leisure" to denote visible leisure for the sake of displaying social status. The term is not used to describe such personal disorders as eating disorders, but is generally reserved for those forms of leisure that seem to be fully motivated by social factors, such as taking long vacations to exotic places and bringing back souvenirs. Conspicuous leisure is a symptom observed in individuals in all societies where stratification exists. Veblen argued that conspicuous leisure had extremely deep historical roots reaching back into prehistory, and that it "evolved" into different forms as time passed. One example he gave was how, during the Middle Ages, the nobility was exempted from manual labor, which was reserved for serfs. Veblen was often regarded as an eccentric intellectual, whose unorthodox lifestyle was well-known in academic circles. He was a tough and unpopular professor, who required from his students to read both German and French, and who seldom gave a grade higher than C. He was also known as a womanizer, whose affairs cost him his career as a serious academic scholar. Before Veblen, economic theory in America was firmly rooted in the theory of laissez-faire capitalism. Veblen introduced new, fresh ideas and inspired new generations of thinkers who challenged the assumptions behind laissez-faire economics. The influence of his ideas peaked in the 1930, as the Great Depression and the rise of fascism in Europe changed the face of capitalist society. Many economists of the New Deal regarded themselves followers of Veblen. Veblen's work laid the foundation for institutional economics, replacing the more static concept of people as the makers of economic decisions based on individual needs with his "evolutionary" idea that people's desires and the means to achieve them are constantly affected by changes in the culture. He regarded the struggle in society not in Marxist terms as between social classes, but between business enterprise, which he believed was carried on for the amassing of money rather than the production of goods, and industry, whose goal is technological innovation. Veblen's work gave new ideas for the following generations of social scientists, influencing Howard Scott's Technocracy movement of the 1930s, and the "instrumental theory of value" of John Dewey. Hodgson, Geoffrey M. 1998. "On the Evolution of Thorstein Veblen's Evolutionary Economics" in Cambridge Journal of Economics. 22 (4), 415-431. Knoedler, Janet T. 1997. "Veblen and Technical Efficiency" in Journal of Economic Issues. 31 (4), 1011-1026. This page was last modified on 7 December 2015, at 22:51.